Garden railroading and Large Scale appeals to model railroaders as well as those who have never modeled anything. This article is written to prepare those who have experience building "indoor" railroads for the differences they will encounter when they move into "outdoor" railroading. "Indoor" model railroaders move outdoors for all sorts of reasons. Some felt like they needed new challenges. Many just thought it looked like fun. And they were all right--it is big, it is fun, and it also provides new challenges. If I haven't scared you off already, take a deep breath and jump in. The average piece of Large Scale rolling stock is about three times as long as the average piece of HO rolling stock. That means that if you are used to using 36"-radius curves in HO, you won't likely be satisfied with anything tighter than 9-foot radius curves in Large Scale (eighteen feet across). Needless to say, many Large Scalers have compromised on that regard, because not everyone has an acre or more to "play with." The first generation of modern Large Scalers included many folks running shorty gear on outrageously tight curves (24"-radius), but folks running eight-wheeled cars have tried to be more realistic. Still, you'll see quite a few railroads that use 4' or 5' radius track, with the same awkward results you used to see when HO-scalers would run full-length coaches on 18"-radius track. Some Large Scalers deliberately choose prototypes, such as old timey, industrial line, or narrow gauge, that preclude any really long cars. Others just pretend not to notice, when their "80' coaches" hang 4" away from the track on tight turns. So, maybe you have room for 8' or 10' radius curves, and you think you're "safe." Be prepared for another shock. Large curves are not as impressive outside as they are inside. For example, I have a loop that's about 36' long on a raised "island" that's about fourteen feet deep. In HO or N, I could squeeze a lot of modeling into that space. But in Large Scale, when I put a train longer than a few cars on it, it looks like the locomotive is chasing the caboose. And when I've asked folks how big they think that "island" is, they say, "Oh, six or seven feet across." Your perceptions get "reset" outside. When everything is bigger, a 30"-long car is not nearly as impressive as you think it would be. To put it another way, you may think a 15-car freight looks "puny" in HO or N, but a Large Scale 15-car freight can easily be between 24 and 30 feet long, depending on the prototypes. So, while a 60' straightaway may look really impressive on the drawing board, a train that would be considered "short" for HO can easily take up half that distance in your back yard. And though this "vignette" may require a great deal of work and financial investment, it won't hold visitor interest more than a couple of passes. That doesn't mean outdoor railroading isn't fun, or that it isn't impressive in many other ways. It just means that your expectations and assumptions about relative size, length of trains, etc., can't be transferred directly from your basement to your back yard (unless you have several acres and infinite funds). Within garden railroading circles we often preach, "Use the largest curves you have room for." Yet issues of relative space have caused many garden railroaders to make compromises (steeper grades, tighter curves, shorter trains, etc.) that allow them to fit a more "interesting" layout into the amount of space they have than they really "ought to" by indoor modeling standards. In addition, many garden railroaders have used the advantage of larger scaled accessories to add "human interest detail" to operational interest. Many HO track plans assume that you'll be able to reach 24-30" across the benchwork or tabletop for maintenance, to "nudge" or rerail trains, and so on. The usability of those track plans is strained when you find yourself standing six to eight feet away from something you need to "fiddle with." Plus, that "dead space" inside the loops--the one you could have filled with a couple plastic industries inside--can easily translate into an 80-square-foot circle you must fill with ground cover or something. A larger consideration is that people expect to interact differently with a garden than they would with a tabletop or bench. Standing on one side of a "virtual tabletop" outside gets old quickly. Many of the most interesting garden railroads allow visitors to traverse paths where they are surrounded by garden and trains on two or three sides. In some cases, visitors step into a loop that runs under the deck or otherwise safely avoids foot traffic. Other railroads hug the perimeter of the back yard, but have "peninsulas" or "islands" that visitors can move around or between, much as they would, say, in a rose garden. Not only do back yards come in all shapes and sizes, but they're all graded differently and have different permanent obstacles (trees, buildings, etc.). In addition, a landscaping material or approach that is "perfect" in one part of the world may be unavailable or inadvisable in another. In short, no plan that worked for someone else is likely to meet your requirements exactly. You can use track plans to get ideas, but temper that with visiting as many operating garden railroads as you can and spending time in your own yard trying to visualize trains going in various directions in various places. Some folks have cut "track pieces" out of cardboard and laid them all over the back yard as a last "sanity check" before ordering the dirt. Others have used athletic field "chalk" to draw the future locations of rock walls or whatever on the grass. In other words, do whatever it takes to help you arrive at a track plan that suits your property and meets your needs. Chances are, though, it won't look much like anything you would use indoors. In the indoor scales, there are relatively few narrow gaugers. But half or more of all garden railroads use narrow gauge equipment. What's worse is that the manufacturers of narrow and standard gauge equipment all choose to run that gear on the same 45mm track. The details of this situation are spelled out in my article "Which Scale Should I Model?". But suffice it to say, if you're used to going to the hobby shop and picking from anything on the HO or N shelves, you may have a rude awakening. In addition to scale differences, you will find incompatible couplers and other, less noticeable incompatibilities that could cause problems later (such as flange differences or Lionel's sound system that is incompatible with AristoCraft power supplies). The "Which Scale Should I Model?" article will give you an idea of what manufacturers you should consider, depending on the kind of railroad you want to model. It also explains why most garden railroaders have made some compromises in scale to have a working railroad without having to scratchbuild almost everything. In the beginning, it may be wise to find one manufacturer that will meet most of your needs and stick with them for the basics until you have a sense of what works and doesn't work for you. Note: Some small-scalers who have been active in the NMRA wonder why the NMRA doesn't "step in" and sort out all the compatibility and scale issues, or why Large Scalers don't look to the NMRA for leadership in this area. Unfortunately, the NMRA did make an attempt to define standards for Large Scale, but their proposal was even more confusing than the "de facto" standards people were already using, and its implementation would have created even more incompatibilities. As of this writing, only a few diehards are following any of the NMRA suggested standards. Many of us would like to see bridges rebuilt eventually and usable standards agreed upon. But in the meantime, don't expect the same level of NMRA support for your garden railroad as you had when you were running trains on benches and tables. I once built an entire S-scale city out of cardboard boxes, wood scraps, and mailing tubes, glued together with Elmer's Glue, and painted with tempera paints. I didn't have to worry about things getting too wet or too dry, about the sun fading and aging my plastic accessories, about tree limbs landing on my buildings, about rodents and insects invading them, or about rainstorms washing away my ballast. Today I am mindful of all those things. Of course there are solutions to all those issues, including: using buildings and accessories designed for outdoor use, painting plastics or spraying them with a UV-resistant coating, using water-resistant adhesives, using PVC instead of mailing tubes, wood instead of cardboard, etc. But all of these solutions are more expensive or more time-consuming, or both, than assembling a $15 kit or gluing a sheet of brick paper over a Kleenex box. That doesn't mean you can't have great structures, towns, and bridges. Only that you aren't likely to have your entire layout populated with structures the first year or so you're operational. Many garden railroaders have learned to make use of "open spaces." They have learned that a few well-executed industrial sites separated by thirty or so feet of "wilderness" can be more interesting than a bunch of kits "shoehorned" into a corner. In addition, they have learned that buildings are subject to the same kind of space considerations as the trains. A model of anything but a tiny prototype takes up a great deal of room and draws attention away from the trains. For that reason, many garden railroaders limit both the number and the size of the buildings they include. This "less-is-more" approach is offset by the quality and diversity of the buildings many garden railroaders use. In the early years of Garden Railroading, few North American-style buildings were available. To keep their layouts from looking just like everyone else's (or looking like they should be in Bavaria instead of California), many garden railroaders scratchbuilt their own buildings (or heavily modified existing kits). That tradition has carried into this millenium; even though a wide variety of kits is available today, the most distinctive garden railroads are more likely to have a few well-crafted structures than many out-of-the box kits. Most garden railroaders use winter to build, maintain, or modify buildings and accessories, so the hobby is not just a four-months-out-of-the-year activity as some people might think. 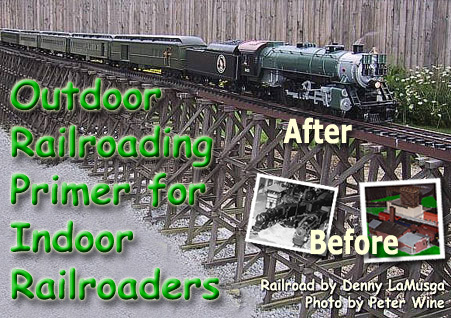 A few garden railroaders pride themselves on construction techniques that allow their buildings to stay out all year long for years on end with few or no problems. Structures of cedar, plywood, PVC, resin, anchoring concrete, and other all-weather construction materials abound. For those who build this way, it's all part of the "fun" of their hobby. When you're sorting through issues of "scale" in Large Scale railroading, you may come across the issue of "economy of scale." That is to say that a smaller marketplace forces manufacturers to embed more of the original design cost into each model. So if a locomotive design costs a million dollars to machine and prepare, and the manufacturer can only expect to sell five thousand within some acceptable timeframe for return on investment, the manufacturer must embed $200 worth of development costs into the wholesale cost of the locomotive to break even (this turns into $300-500 retail, depending on the distribution channel and pricing structure). In addition, LGB set the expectation for high prices early in the "game." The ability to sell $100 boxcars, etc., got a number of players into the market who might not be there today, so this wasn't entirely a bad thing. But overall, you will discover that Large Scale stuff seems to be priced high by small scale standards. That doesn't mean you can't have a very nice Large Scale railroad, but it may mean you may have to "scale back" your expectations a little, at least at first. After all, a fifteen-car freight can be 25-30' long--how many cars do you really need or have room for anyway? Or how much do you want to schlep back and forth? One place not to scale back is in the quality or amount of track. Don't "save money" by using the track that came with your starter set. Save that for the Christmas tree. Again, use the widest curves that will fit your space and your needs, and use a reliable brand. (I use AristoCraft, which makes a better physical and electrical connection than LGB, and which has more realistic tie spacing than USA). The garden railroad clubs are full of people with four hundred linear feet of cars and two hundred feet of operational mainline. The truth is, for many people, it's easier to pick up a $100 car at a hobby shop or train show than to lay a couple more feet of track. Get a good track system installed, and then you may discover that you are quite satisfied with a fraction of the rolling stock you would have "needed" in an indoor scale. Note: For some hints on saving money on all aspects of Large Scale railroading, refer to the article "Building a Garden Railroad on a Budget." Routing permanent power to a garden railroad frequently involves burying cables or other labor-intensive operations. Large scale locomotives require more amperage than indoor trains. Large scale railroads typically have longer track runs than indoor trains, making the ability to get power to the far end of the railroad more interesting. Garden train operators are usually grounded, so there is greater danger of injury from misrouted electricity. Running wires to accessories, turnouts, etc., is much more complex, since you can't exactly crawl under the table. That doesn't mean that garden railroads are inherently unsafe and difficult to wire. In fact, indoor railroaders with good wiring habits easily overcome all of these obstacles. But poor wiring habits, such as poor planning, poor splicing, and poor labeling and record-keeping can cause frustrating—and sometimes dangerous—problems outdoors. Avoiding wiring altogether - Using a combination of battery, solar, manual (and maybe live steam) power to run trains and operate accessories. Avoiding 110v AC in the garden - Leaving the high-voltage part of the power chain indoors and running only low-voltage lines to the railroad. Using 110v AC more safely - Following code and instructions for all electrical components, installing GFIs, and maintaining a strict "demarcation" line beyond which no 110v power may intrude. The Family Garden Trains article Electrical Safety and Garden Railroading provides more information on this topic. Whatever techniques you use, it will require actual physical work to create and maintain your railroad. The easiest kind of garden railroad to build, one flat on the ground, is also the biggest "pain in the back" to maintain, because you're always bending over it to blow sand out of turnouts or perform other maintenance. You might say, "Well, duh. I wouldn't build my HO layout on the floor, why would I build a garden railway on the ground?" And many, if not most, garden railroaders agree. A rule of thumb is that twelve inches of elevation is better than flat on the ground, and 24" is much better than twelve. (People who are chiefly interested in "live steam" typically build even higher, since they have to service their locomotives while they're on the tracks.) But building a raised garden railway requires a great deal of physical labor, moving rocks, railroad ties, landscaping blocks, tons of dirt, etc. A railroad of any size elevated 24" off the ground can entail hundreds of wheelbarrow trips just to backfill, not to mention hauling the ties, stones, etc., you use to hold all that dirt in place. I used a typical Ohio "rock garden" technique for most of my railroad, which means that I have moved a lot of rocks (and some railroad ties). And bigger rocks make for more solid and impressive construction. However, I gave up using rocks over a certain size when I realized that a friend of mine, who did some spectacular landscaping with rock walls in his thirties, has suffered from nearly debilitating back problems for the last twenty-five years. No matter how impressive my railroad could be, it's not worth chronic back pain. Even if you follow the Martha Stewart route and have your gardeners do all the real work for you, there will still be mantenance requirements. One mistake some garden railroaders make is to build a raised layout, then install a great deal of track they can't reach from the perimeter, so they have to clamber all over the layout anyway (the outdoor equivalent of climbing on your benchwork). Even if you don't have track you can't reach, consider hidden access steps or paths for those times when you need to replace a planting, rake 1:1 leaves out of your 1:32 forest, or whatever. Others have used "quick-and-dirty" construction techniques, then had to rebuild a wall or other feature when it came apart after a week of heavy rains or some such. Yes, if you design your garden railroad properly, you can build it so that you have relatively little heavy work to do once things are up and running. But however you do things, a garden railroad is bound to require more heavy lifting and more bending over than an indoor railroad. In most parts of the world, people don't leave their trains out all year. Many people bring their buildings and accessories inside as well for the months of worst weather. Think about where you're going to keep all this stuff. You may be used to storing the rolling stock for an HO empire on a single bookshelf, but you find your Large Scale trains take up half of the garage. Remember, a Large Scale car may have twenty-seven times the physical bulk of the equivalent HO car (3x3x3). That doesn't mean that there aren't many excellent, creative solutions to the problems this creates, only that you will encounter them sooner or later. When I modeled indoors, I cleaned the track and blew the dust off the buildings and accessories once a year whether they needed it or not. I never had to clean bird poop off the rails, replace ballast that the mourning doves had pilfered, pick fallen tree branches off my cities, trim my spruces, pull 1:1 leaves out of my ponds and streets, replant the pond plants the raccoons have dug up trying to catch my fish, or weed my roadbeds. The amount of maintenance required is not enough to ruin most people's enjoyment of the hobby, but it can be considerable, depending on the extent of your empire, and how picky you are. And most of it has to be done within a 4-6-month window, when you may be busy with other activities (soccer, etc.). I don't think it's surprising that most of the really nice, well kept-up garden railroads you see are owned by retirees whose children have moved out of the house. This isn't to say that a person with children at home shouldn't attempt a garden railroad, only that a garden railroad has a life of its own, and won't survive six months of neglect at a time (as your indoor railroad probably has more than once). Many garden railroaders who are committed to realistic operation have installed at least one loop they can use for continuous running. That way, when they really have to do some weeding or whatever, they can at least see and hear their trains going around the track. The best solution for moving trains in and out would be a 20'-long shed attached to your railroad. Unfortunately, most garden railroaders don't have space or funds for such a project. Others have come up with creative solutions such as storage tracks under the deck, etc. But one way or the other, unless you leave your trains on the track all summer long (not possible in all neighborhoods or all climates), you will have to schlep stuff in and out every time you run. There are also creative "schlepping" solutions, custom cases, little trailers, etc., people build. But it's still not the same as walking down the basement stairs and throwing the power switch. Back to the folks with 400' of trains and 200' of track. You would be surprised how many folks, after the first few years, run only a tithe of their rolling stock. Unlike our "superscale" days, when we could only be satisfied with a particular prototype running a particular type of operation, we have discovered that garden railroading offers all kinds of opportunities for enjoyment--opportunities that don't necessarily depend on a particular paint scheme or driver arrangement operating at a particular time. That doesn't mean you can't still be particular about such things, only that you may discover that, no matter how many pieces you could run, most of your time is spent with a select few. Model train manufacturers wait until they've recouped their investment in one locomotive before they start designing another. HO and N users are used to having many selections in motive power, but their markets are much larger and they've been around much longer. In Large Scale, each new steam locomotive that comes out is a major event. If you want to model a line that had truly distinctive steamers (like Reading's, PRR's, or NKP's), you will soon discover that few or no versions of your favorite locomotives are available at any price. (Diesel lovers, on the other hand, are fairly well supported.) Again, Large Scalers may compromise by "adopting" models from other railroads, kitbashing their own, selecting a railroad that used mostly "generic" gear (USRA locomotives, etc.) or creating their own railroad name. Again, once you have a garden railroad in operation, you will realize that a few useful engines are all you'll operate on most days anyway, and having a big collection of stuff in the right colors isn't as important as it may seem when you're starting out. If you are coming into Large Scale from a relatively small, underserviced niche of an indoor scale (say, Sn3), you'll feel right at home in Large Scale. Most areas of the country don't have one decent store supplying the hobby. Many areas of the country don't have clubs (although the number of clubs is growing). And some traditional model railroading clubs refuse to take garden railroading seriously. Worse yet, some geographic areas that have functional garden railway clubs are dominated by one or two individuals who have a "my way or the highway" approach to the hobby, so you can't fit in unless you convert completely to DCC or battery power or something. You may be very used to a functional club or shop in your community, and you may discover that there is no such resource for Large Scalers where you live. That doesn't mean you're on your own. It just means you'll have to look across scale or geographic lines for friendship and support. Garden railroaders support Large Scale train shows, interact on Large Scale web sites and e-mail lists, and subscribe to the same magazines (even though they may criticize the editorial policies or whatever). Overall, garden railroaders have become a fairly supportive extended community. In the last year I have been appraised of two new "international" Garden Railroad clubs that are supposed to do for garden railroading and large scalers what the NMRA did for the indoor scales. Also, the NMRA keeps trying to figure out how to be more supportive of Large Scalers, and one day they may get it right. But a garden railroading newbie used to effective local club and retail support may have a "transition period," before he or she reaches satisfactory equilibrium in the new environment. Garden railroaders get to play with really big trains, they have an "excuse" to play outside on pretty days, and they generally get to associate with some pretty decent people. Those who are new to model railroading may use features and combinations that more "serious" model railroaders wince at, but on the other hand, few "serious" indoor model railroaders will make the transition without some compromises. Some of you have come to garden railroading because you wanted a new challenge. Others have come because it just looks like fun. Well, you will probably get more of both than you bargained for.